Matthew Dent, President and Chief Operating Officer of the Buffalo Rock Company, is responsible for the company’s overall operations in Alabama, western Georgia and the panhandle of Florida. Buffalo Rock Company was founded in 1901 by the Lee Family and today is the largest privately held Pepsi Bottler in the nation with over 2,100 employees serving a population base of nearly 7 million. The company also operates as one of the largest snack vending companies in the Southeast. Matthew began his career with Buffalo Rock serving as an intern during his junior year at the University of Alabama, where he subsequently received his degree in Marketing from the Culverhouse College of Commerce. That proposed 3-month internship developed into a 2-year part-time position where Matthew garnered experience in warehouse operations, store level execution and sales, budgeting and planning, and direct support to the Tuscaloosa General Manager. Prior to his graduation in 1997, Matthew was hired full-time working directly with the Company’s Senior Leadership where he coordinated improvement projects and realigned operations, eventually being named Corporate General Manager of Marketing & Strategy. In 2005, as Vice President of Corporate Development, Marketing & Strategy, he assumed broader responsibilities, including the overall management of the 10 operating divisions and becoming directly involved with the executive management of his fellow officers. In 2008, Matthew was named Executive Vice President/Chief Operating Officer and then named President/Chief Operating Officer January 1, 2011. 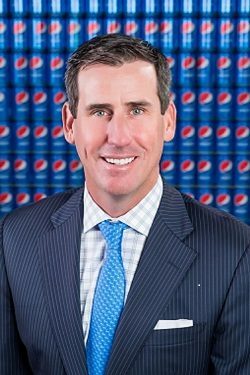 Pepsi Cola Bottlers’ Association – current Board of Directors member, and Serving as Vice Chair. Among other accomplishments, Matthew was named finalist in Birmingham’s 2012 Top CEO Awards, as well as, 2007 Top 40 under 40 by the Birmingham Business Journal. Matthew enjoys spending time with his wife (Jen) and their two young children (Thornton 12, Chapel 9). They reside in Birmingham, are active members at Our Lady of Sorrows Catholic Church and enjoy traveling together, snow skiing, boating, water sports, playing golf, and being personally involved in their friends’ and families’ lives.